Silver Falls: To reach this scenic spot, visitors travel east on Colo. Highway 160 for about 10 miles from the San Juan River Bridge in Pagosa Springs before turning right (east) on East Fork Road (#667). After about eight miles on the East Fork Road, the historic Silver Falls Forest Service Guard Station be visible on the left (north) side of the road. Hike past the building about one-eighth of a mile to reach the base of the falls. Treasure Falls: The Treasure Falls area is steeped in folklore and legend. Its name comes from accounts suggesting that a chest full of gold was buried in the area after a group of Frenchmen was captured by either Spaniards or Indians. Visitors can think about the legend as they visit the scenic falls today. Driving east on Highway 160, about 15 miles from the east side of Pagosa Springs, there's a large parking area with a trail leading up to the falls. Travelers can either hike to the falls or enjoy the view from the highway. Lean Creek Falls: Located at the confluence of Lean Creek and the middle fork of the Piedra River, this tall, narrow waterfall is only accessible from about late July or early August. Visitors have to scramble over ledges and walk through the river to reach the falls, so these falls aren't recommended during high water season - or for anyone who's timid! 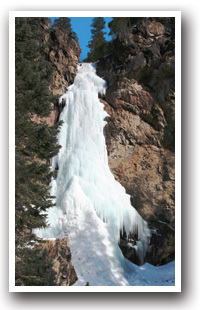 To reach the falls, take Colo. Highway 160 west from Pagosa Springs to Piedra Road, at the crest of the hill. Turn right on Piedra and travel for about 17 miles to Middle Fork Road. Turn right and follow the road to its end, about five miles. At the end of the road, there are several trails up to the falls, about one mile. A Waterfall Without A Name: This no-name waterfall - which has the largest vertical drop of any waterfall in the district - is a difficult excursion that usually requires an overnight back-pack trip. It's reached by hiking about 10 miles up the Williams Creek trail in the Weminuche Wilderness. Turn west at the Squaw Pass trail and hike for another three miles to reach the falls. Piedra Falls: Tumbling down volcanic cliffs in two large steps, Piedra Falls is on of the most popular waterfalls in the Pagosa District. 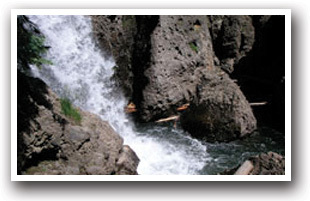 To reach the falls, take Colo. Highway 160 west from Pagosa Springs to Piedra Road, at the crest of the hill. Turn right on Piedra and travel for about 17 miles to Middle Fork Road; turn right. Take Middle Fork Road two miles to East Toner Road and take a right. Follow the road to its end, about eight miles east, and follow the path upstream to the base of the falls. Second Box Canyon: This canyon, cut by the Piedra River, showcases layers of rock from the Precambrian geologic time period. Its wild rapids have given it nicknames ranging from dilemma to snarl. The canyon is only accessible on horseback or by foot. To reach Second Box Canyon, take Piedra Road (see the Piedra Falls description) northwest about a half mile past the Piedra Bridge. 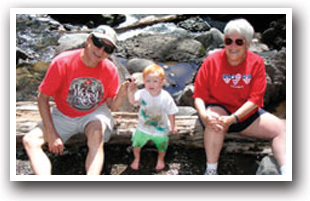 From there, hop on the Piedra Trail and follow the river downstream to Sand Creek. The canyon starts on the down river edge of the large meadow at the confluence of Sand Creek and the Piedra River. Fourmile Falls: An easy to moderate hike revealing a spectacle double waterfall north of Pagosa Springs. Includes breathtaking views of Eagle Mountain (12,007') and Pagosa Peak (12,640'). 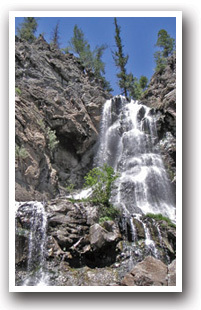 To reach Fourmile Falls take CR 400 north from US Highway 160 in Pagosa Springs. Travel approximately 8 miles to Fourmile Road and continue 5 more miles to roads end. This is the hiking trailhead, a three mile hike leads to the falls.